This afternoon I decided to cook a comfort food meal for supper. I whipped out my mother’s trusty green cookbook loaded with Hungarian dishes and picked one that caught my eye some time ago. The Hungarian name for it is “Koloszvari kaposzta” (Scalloped Pork and Rice). 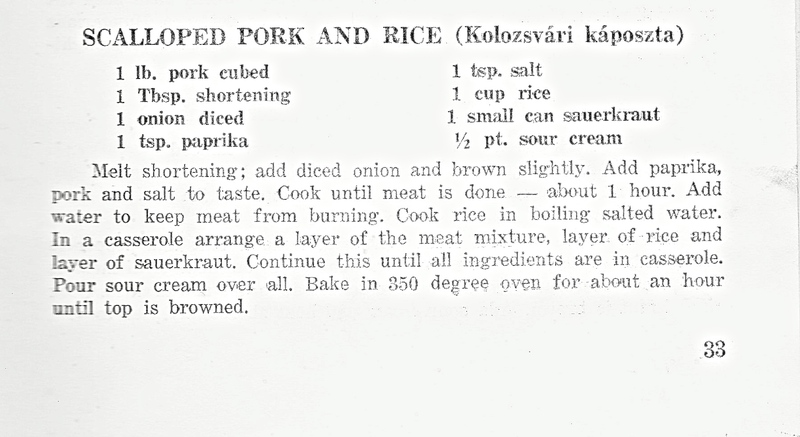 It has all the ingredients that I love: pork, rice, sauerkraut, sour cream, paprika, onion, and salt. How could I go wrong? Let me tell you the ways. I follow recipes like a chemist follows a formula. It looked suspicious when I pulled it out of the oven, and I confirmed my suspicions. It didn’t look like what my mother used to make. She had a knack as did all her girl friends, and they were the ones who wrote this cookbook. Somehow the knack is something you learn by doing, and not by reading the recipe. 1. I would use a deeper, but smaller casserole dish, but I don’t have one. Why? Because the ingredients were slightly on the dry side. The large area of the dish I use allows the meal to evaporate its moisture in the oven. A smaller area, deeper dish will make it harder to lose the moisture during the oven time. 2. I will use more sauerkraut and juice between layers of meat, rice, and sauerkraut. I used what the recipe calls for and I felt it lacking. I love sauerkraut and sour cream. 3. I will cut the oven time by fifteen minutes to shorten the drying process. 4. I will try the same meal mixed in a pan on the stove and skip the casserole completely. I have cooked Stroganoff like that and it turns out fabulous. 5. I will use less cooked rice, so there will be less absorption of meat juices during oven time. As I told Peg during supper, I’m beginning to sound like a cook; Always analyzing flavors, textures, moisture, etc. I do that in search of the knack that Mom and her buddies left out of the words but included in the invisible instructions hidden between the lines. Thanks Mom, I’m getting closer, but will I live long enough to learn the KNACK?